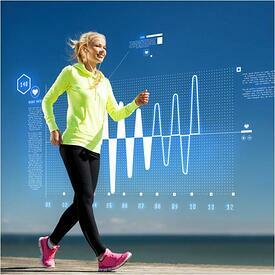 There’s been a lot in the media lately about wearable technology having a strong presence in corporate wellness. Employee wellness programs have provided a whole new market for some wearable manufacturers, and one research firm indicates that upwards of 13 million wearables could become part of employee wellness initiatives in the next five years. This specific high-tech phenomenon is fairly new and relatively unresearched in terms of long-term effectiveness at helping adults make sustainable health behavior change. But technology in corporate wellness has been around for years and it has evolved to keep up with perceived wants and needs. Years (and I mean years) ago, we used to take health risk assessments (HRA) on paper. Then those moved to this thing called the internet. Eventually, we got “smart” feedback on those HRAs and our fingerstick data was integrated with our self-report HRA responses to create a profile. Now we have web capacity to integrate with pedometers and other higher-tech wearables like Up® by Jawbone® and various products by Fitbit. The data syncs up to a company site where we can compete with our peers, and it links with our own tracking tools on our phones. We have access to a lot of information about our movement. Still, I wonder if data is really king when it comes to health behavior change. Are high-tech solutions enough to help someone move their own needle? You probably have anecdotes where someone’s health was profoundly changed with the help of a wearable, an app, or some combination. You, like me, may also know stories where a wearable began an obsession with data and quickly sucked all the fun out of measuring the movement. So effectiveness may very well be in the arm of the wearer (so to speak). Still, there are definite limits to today’s tech solutions. Maybe someone will solve them down the line, but right now, as I see it, there are barriers on tech that limit potential impact on improving health. There’s a great outline of these limits in this Forbes article. There are other issues with a high-tech-only solution that have come to light recently, as well. For example, while more and more boomers (who are still in your workforce) are adopting technology solutions in various areas of their lives, they still lag behind Gen X and Millennials in their rate of adoption. This article makes the case that boomers may be the demographic most likely to benefit from, and most willing to pay for health-related technology, but the market isn’t designing for them. And while the technology certainly supports what seems to be the unquenchable thirst for data, there is still the tricky math involved in determining whether your employee wellness device translates to actual company savings on health care. When you look at the challenges identified in the Forbes article, many (dare I say all) of them can be worked through or even remedied by a human being with a brain and some capacity for nuance. And here’s where high-touch in corporate wellness steps up. Both capable of and passionate about helping your employees establish healthy goals and effective plans to achieve those goals. Compassionate motivators who have the right skills to nudge participants toward finding their own intrinsic motivation. Nuanced enough to know when to step in to provide a course correction when your employees stop engaging or when their efforts aren’t achieving the carefully crafted goals. Savvy at helping participants understand their data in a way that’s meaningful and impactful. Using people in a high-touch capacity to bolster and back up your high-tech tools can be an effective way to help your employees achieve better health.